The 10 Best Bagel Shops in Connecticut! Whether toasted or cold, with cream cheese or butter, Connecticut’s best bagel shops aim to liven up your morning commute. With numerous selections and shops serving other goodies, like egg sandwiches and doughnuts, grab a baker’s dozen to taste all the options. Here are the 10 best bagel shops in the state! As a long-time local favorite, Flanders Bakery easily serves the best bagels, doughnuts, and breakfast pastries in the area. With bagel options like egg, pepper jack, Asiago cheese, cinnamon raison and more, you’d better plan to arrive early for the best selection. In addition to their fabulous bagels, another reason they are the tops is that they evenly spread cream cheese or butter on both halves of the bagel. This top-rated bakery is open early and serves coffee, doughnuts, bagels, and breakfast daily. The kind, father-son owners produce a variety of bagels including multigrain everything, plain, cinnamon raison, poppy seed, and more. Bagels can also be used for freshly made egg sandwiches prepared to your order. Weighing into the Connecticut bagel scene is Bagel Delight with their massive bagels. Serving options such as onion, colorful rainbow, salted, and more, visitors are sure to find their favorite. If you are looking for something a bit more filling, bagels can be used for egg and bacon sandwiches or topped with a variety of cream cheeses. With fresh bagels baked daily, Liz Sue Bagels is a perfect place to stop on the way to work. Bagel options include rye, garlic, oat bran, pumpernickel, everything, and several more. Also on the menu are muffins, egg sandwiches, pastries, and mayonnaise salads such as egg, tuna, and chicken salad. Numerous smears are also available to top off your bagel selection. Open for more than 10 years, Cohen’s Bagel Company serves up amazing bagels to the Madison community. With gourmet bagels, such as French toast, cedar, cranberry orange, sun dried tomato, and blueberry, Cohen’s has several options that won’t be found elsewhere. Breakfast bagel sandwiches are also served and consist of toasted bagels topped with cheese, eggs, vegetables, and breakfast meats. Transporting you to New York City with their freshly-baked bagels, stop by and grab a bagel with homemade pastrami or lox. The different bagel options offered can also be used to create one of their several amazing breakfast sandwiches such as Spanish Fly, Meat Lovers, or Mother Clucker. Bagel lovers will rejoice in a visit to Village Bagels with its more than 10 bagel options on the menu and numerous smears. Consider combos such as toasted pumpernickel topped with sundried tomato and basil, or for something sweeter, cinnamon raison with walnut raison whipped cream cheese. You’ll certainly be licking your fingers after a stop here. 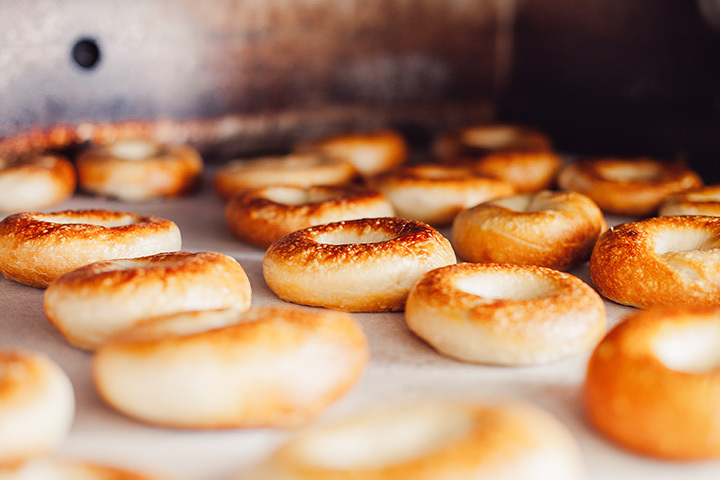 This simple grab-and-go spot bakes some of the best bagels in the state. Options are certainly plentiful here and include rows upon rows of bagels ready to be topped with cream cheese, lox, Nutella, eggs, and more. Upper Crust Bagel Company specialized in perfectly done bagels, creative spreads, and breakfast sandwiches. Spice up your morning with hot horseradish spread on your bagel or enjoy the childhood favorite of PB&J. If you happen to be too busy to stop by, they also conveniently offer delivery by Seamless! Serving up some of the best New York-style bagels in the state, Bagelman’s menu features flavors such as onion, cinnamon raisin, pumpernickel, and French toast. If you’re looking for something a bit heartier than just cream cheese, complement these fresh bagels by ordering a hot breakfast sandwich. Pair that with one of their excellent cappuccinos, lattes or espressos, and you’ve got yourself a near-perfect morning.